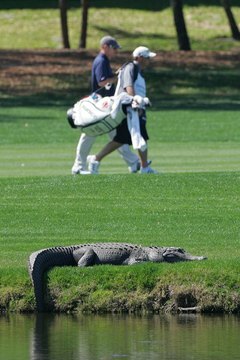 Although not a concern in most of the US, alligators can lurk in water hazards on Florida golf courses. Golf is meant to be played outside during pleasant weather; warm summer days are made for golf. There are few things more enjoyable than sinking a long putt on the 18th green before heading for the clubhouse and a cool drink. But there are dangers on the course and not just slicing a ball into the trees. Keep an eye on the weather while you play and make sure you start off completely hydrated. During hot weather, heat, humidity, exertion and not drinking enough water can lead to heat stroke, which occurs when the body loses the ability to cool itself. The person stops sweating, becomes dizzy, confused and disoriented and may lose consciousness. If treatment isn't sought, death may result. When on the course, drink plenty of water. In dry climates with low humidity, sweat evaporates quickly, so don't depend on sweat as a signal you should drink. Stay away from beer and other alcoholic beverages; they are dehydrating. Golf courses are havens for all sorts of critters, from cute little squirrels to alligators lurking in the water hazards. With all the animal programs on TV, it might seem as if that coyote or raccoon you meet is tame, but wild animals are wild even in urban areas. They will attack. Snakes can be a problem in warm-winter climates such as in Arizona and Florida, two U.S. golf meccas. Don't look for a lost ball by reaching in where you can't see. Use your club to push grass and bushes out of the way. And if you see a javelina--wild pig--munching on the green, let it play through. You're out on the 15th hole getting ready to tee it up when you hear the dreaded horn that says clear the course--lightning has been spotted. You look up and see only a few white clouds overhead, although there are some darker ones in the distance. You're thinking, "Should I leave the course and call it a game?" Yes. Consider this: At the top of a golf swing, your club--often made of metal--is most likely the tallest object around. Just because it's clear overhead doesn't mean there won't be lightning. The bolt from the blue is real. Lightning can strike up to 10 miles from the parent cloud according to Sky-Fire. Playing on tight fairways leads to the danger of being hit by a golf ball, which can cause serious injury depending on the shot that was struck and where you're hit. Be aware of other players around you. Listen for the shout of "fore" and take action, such as ducking and covering your head. If you hit an errant shot, yell "fore" as well. It's better to call attention to yourself and be a little embarrassed than not yell and hurt someone.